From there it "came to the West" albeit many years later, and the rest is history. It seems that every Chinese nowadays is a SoC or/and an electrical engineer. Some time after that I was fixing up an X32 for a friend which was in terrible condition, with lots of screws missing; I figured I might as well butcher the T43p for screws and save what else might be worth keeping (like the 1400x1050 14" LCD panel). I was just about to put a screwdriver to it when I though why not give it one last try, for old times sake? I plugged the old beast in and could scarcely believe my eyes when the RGB IBM logo sprang up on the screen - it had survived! This was great news of course, and testament to the incredible build quality of these machines, but I now do all my work on the Intellistation and I haven't had all that much use for the T43p. Then I read about this mod and got tempted to give it a go (worst case, the machine should have been dead anyway! ), and when I ended up with a spare Samsung 830 SSD that I didn't have any other use for I decided to take the plunge. I stocked up on some ultra thin single core wire, and found a perfect donor MB -> RAID cage SATA cable amongst my junk, and yesterday evening the surgery began. By far the scariest part was desoldering the PATA controller chip - chucking that amount of heat onto an SMD packed multiple layer board was terrifying, especially with a Portasol... And the darn thing took it's time coming loose too; after building up the temperature for a while (also from underside) I grabbed it with a pair of pincers, and even after turning up the heat gun to max it still took several agonising minutes before it came loose. No smoke, blistering or other sings of heat damage though, and it released quite cleanly (I checked the pads with a loupe and a needle to make sure there were no shorts formed by the left over solder). You'd never think it was my first SMD chip desolder! It is now eight in the morning here and after 9-10 hours of careful work I now have the case back together, all nice and tidy - and the Samsung SSD is working! I am currently installing Xubuntu 12.10 from a USB stick and it seems quite a lot faster than the 250gb mechanical drive it replaces. Oh and it's wonderfully silent and cool - even the southbridge seems to have cooled down as the palmrest doesn't get warm any more (could this be because I opted to completely remove the PATA chip?). Many thanks for sharing this awesome mod! Oh it's fast alright: hdparm -tT shows buffered disk reads at 120Mb/s - ahelluvalot faster than the mechanical drive I had in there before. Result! No need to heat the PATA bridge chip from underside, only top side. It takes some time because there are four ground pads on the chip besides regular pins and those require more time to get up to the melting point. RealBlackStuff wrote: I have now done it several times in a 15" T43p. 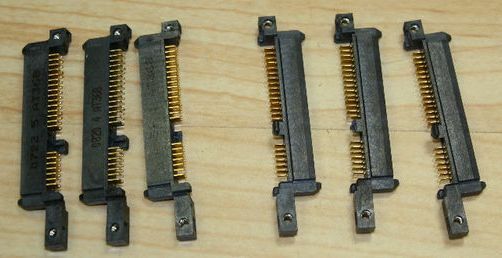 After a few experiments, I found out that the best one is a SATA connector as used in HP DV6000 and DV9000 laptops. It is imperative to look for this item with HP P/N AT368. Similar looking parts with different ATxxx are available, but these have smaller nuthole-diameter and are no good! like 5 minutes and it won't let go! I don't really want to go nuclear with a handheld heat gun on the board. The reflow station should work! I use an old 1200W paintstripper. On that gun I concocted a nozzle with a square opening of ca. 1/2" x 1/2" (from an empty soup can). Run that in small circular motions over the chip, at full blast, for about 1-1/2 minute at a distance of about 2 inches. Use a dentist's pick to 'whip' it off. Done it about 50 times by now! There's one other item that makes this hot-air business much easier for me, but that is my "trade secret". concerned or not, as it looks like it feeds the chip we're working to remove, so maybe it doesn't matter. Well, bought a harbor freight heat gun tonight, i needed one for heat shrink anyway. been doing it with a propane torch for years poorly. Time to upgrade. So i managed to get the chip off the board. To those considering this mod: This chip is REALLY REALLY small, and there are components around it that are sensitive. More on that in a minute. Do not even attempt this unless you have magnification available and you have some experience with soldering. When i got ready to pull it off, i covered all the plastic connectors and the southbridge with aluminum foil to be safe. I wrapped everything around the edge, so nothing moved around with the airflow. I heated the chip for about a minute at high setting, around 750F. I then flicked it to the side using a pick. Unfortunately, this also dislodged some resistors shown below. The three pads circled i have the resistors. They can be carefully moved back and reflowed. The one with an arrow, is the missing one the guy with the solder braid lost. Anyone have any ideas on if these are still needed? I don't think the wire soldering will be a problem, just these smd components are sooooo small, it's hard to do this sort of work without losing things. My trouble right now is that my only real magnification at home is my cell phone camera, and all the reflow stuff is at work. i might have to carefully take everything back and do the work there under the scope. in the event that the ONE missing resistor is still needed, can anyone out there with a T43/R52 motherboard check the resistance of that one with the arrow with a multimeter and let me know what it is? My "trade secret" is the bottom of the same empty soup can, let's call it TM. I cut a square hole in it, slightly bigger than the chip and its soldering. Then I made 4 small pieces, each the width of one side of that square opening. I used rivets to attach those 4 pieces from above, with the short sides pointing down inside the square hole. The TM was wide enough to fit along the base of the wifi card, under the left metal wifi clamp and fits exactly over the upstanding contact"bar" from the (removed) PCMCIA cage. I bent it in a shape that goes over it. When you put that TM with the hole over the SATA chip, all the surrounding resistors/capacitors are covered. The chip sits exactly in the middle of that hole, and the 2mm sides prevent (not all, but most) hot air from going under the TM, where it would otherwise heat up the surroundings of the chip. When the TM is in place, put a piece of good tape (I use Kapton) over that cage-edge, to stop the TM from moving. I have made a "blanket" of about 8 layers of heavy duty tin foil to fit over the bottom half (from CPU downwards) of the motherboard, with just a small square opening over the SATA chip. With that cover, plus my TM, you can only heat up the chip itself, the surrounding bits get only (very) warm, but not enough to come loose. i can see how that would work well. Frankly, i'm not sure how anyone but a few people could pull this sort of stuff off. three resistors, then clean up the board. And i'll be using a stereo microscope and the reflow station. I'm not sure i'll need to replace that one missing one, as it appears to feed the marvel chip. I guess i can try powering the board up first and see if it will work. It took me nearly 2 days to make the TM the way I wanted. AFAIK you must put that resistor back. At one time, before my TM, whipping the chip out went slightly wrong, I shifted the chip to the right instead and that particular resistor also moved. And then I lost it somehow when trying to solder it back. That mobo just would not start without it. So I took it from another parts-only mobo, but it took me the better part of an hour to solder it back! As I'm getting older, this lens was not powerful enough any more, so I bought a very good 4" lens with 10x magnification. I removed the 5x lens and put that 10x lens in. I don't understand why your fancy rework station cannot unsolder that chip, whereas my $1.- paintstripper heatgun from a yard-sale can! Last edited by RealBlackStuff on Thu Oct 10, 2013 4:56 am, edited 1 time in total. Well that was a disaster. No matter what I try, I cannot get the resistors to solder back in. resistor in place with a xacto knife, i tried my smallest solder tip and it looks like a bazooka under the scope compared to that resistor. I even managed to get a solder ball on it that enveloped the entire resistor. managed to get it back out again, but i'm way under equipped for this job at this time. To top it off, when i was using copper braid to remove extra solder from the SATA lines area, i managed to lift a couple of traces below the sata copper through holes. Although looking at them, i don't believe the traces that lifted are to anywhere other than the marvel chip. Now you mention that I need that one resistor, and i'll have to order from digikey, which has a $25 min order, and I'm thinking that this board is just too far gone. SOOOOO, I have an R52 chassis, a bunch of upgrade stuff on the way including an UXGA screen, if I wanted to build the perfect setup to fit in my R52 chassis, what would I go with? Just buy a duplicate R52 motherboard with ATI chip, or is there something else better? Last edited by 86turbodsl on Wed Oct 09, 2013 2:36 pm, edited 1 time in total. I held that resistor in place with a small screwdriver, and used a soldering iron with a sharp tip (filed down to pencil-size), using 60/40 leaded solder. That's were the 10x magnifier really came in handy. You can use either a T43/T43p or R52 mobo with ATI GPU. Bought from him several times. FYI: T43 boards do not have a Firewire connector! RealBlackStuff wrote: I held that resistor in place with a small screwdriver, and used a soldering iron with a sharp tip (filed down to pencil-size), using 60/40 leaded solder. The 1.33kOhm chips are the only ones available. Nope, I have that resistor first on a piece of ribbed (partly hollow) carton, press it in, so it can't move, then put a bit of solder on each end. Cool it, then use tweezers to move it to the correct mobo position with the solder pointing down. Place mobo under the magnifier lamp. Hold resistor in place with that small screwdriver, then heat first one end of the resistor with the soldering tip, until you see the solder melt (within seconds). Let cool. Do the other side. Done. Only this time it takes no more than a minute or two for the whole procedure. RealBlackStuff wrote: Nope, I have that resistor first on a piece of ribbed (partly hollow) carton, press it in, so it can't move, then put a bit of solder on each end. So perhaps my goal should be to get a 10X magnifier glass, and a super fine solder tip instead? What would you do? Fight with the three resistors, and order a fourth from Mouser? Or just give up and get a R52 mb? Knowing that i would have to do this all over again and make a heat gun mask too? I don't have a hard drive yet, but really had my heart set on a 1TB drive to go with my UXGA screen. It doesn't have to be fast, but it does have to have room for multiple OS's on it. I thought we agreed you wouldn't tell anybody! Those lions make mighty fine pets once they are tamed and trained, but there's only one thing wrong with them. When I let them out to do their 'business', they never go after those pesky chipmunks! They make tunnel exits all over the backyard, as well as a hell of a racket in their mating season. So I feed them pieces of Juicy Fruit chewing gum to get rid of them. It's a known fact that chipmunks cannot digest this gum. They'll gag on it and then go exactly where I want them to go: the eternal hunting grounds. I hate these chipmunks almost as badly as tree frogs! HA HA HA HA!!!! Success. Successfully soldered the three loose resistors on the board, and only have to order one tiny 1mm long resistor to complete. I'm fairly ecstatic. My co worker looked under the scope and said i was crazy. I've read through most of the posts on this thread and others in the Thinkpad.com forum on breathing new life into T43p Thinkpads and it seems that in my case (2687-5DU) the best option would be to carry out the SATA mod on the mobo. I'm not a complete novice when it comes to soldering (I successfully replaced the capacitors in my Samsung 214T monitor) but, I'm not 100% confident that I could remove the Marvel chip as I don't have a heat gun (except one that I use for stripping paint) with temperature control and I'm worried that I may finish up destroying the motherboard. I could ship the m/b to "Real Black Stuff" to do the job for me but the shipping costs both ways would add about $US$180 to the SATA-mod cost which makes it a rather dubious investment. Nevertheless, I'm still keen to update to SATA-SSD if I could find someone local (in Australia or preferably in Sydney) who has already done the conversion on a T43p. Is there anyone out there who might offer this service in Australia? If so, I'd love to hear from you. 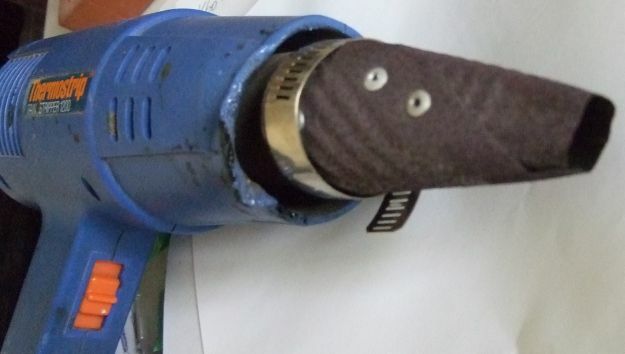 a 1200W heatgun/paintstripper, that I bought for a song in a yard-sale. I used an old tin can to make the 'spout', bent it squarish at the opening, and then put some rivets in to hold it together. Then used an adjustable hose-clamp to attach it to the heatgun. At full blast, about 1-2 inches from the chip, it takes less than 2 minutes to remove it. Of course I cover the surroundings of the chip with heat-resisting material. resistors and capacitors, when it gets removed. But that tool, my friends, is my "Trade Secret", not to be shown, ever! I am going to try the SATA mod on one of my R52 boards, however the board has SiliconImage SATA/IDE converter chip instead of the Marvell chip. Is the pinout of the SiliconImage chip exactly same as the Marvell chip? There are also two grounds, pins 2 and 40. From which pins I need to get +5V and GND in order to supply SATA HDD/SSD sufficiently? 44 42 40 38 36 etc. ..43 41 39 37 etc. Cut off all the IDE connector wires completely, except leave a few mm at pins 42 and 40, to solder your +/- wires on. Yep, that's my plan. Thanks RBS. OK, I have started yesterday. I have the SATA cable prepared from a desktop computer. Most dirty job was to cut all the pins from old IDE connector precisely - now I have +5V and GND pins prepared. Tomorrow, I am going with the mobo to my wife's electronic workshop where we are going to desolder the SiliconImage chip using heating gun with an appropriate nozzle.